Stay Away From Travelocity’s Mobile Site! I don’t know about you but when I travel I tend to use my mobile browser a lot. Checking flight status, finding hotels and restaurants are common tasks for the traveler and even if you have a laptop with you it’s usually easier to just pull out your phone. I’ve never actually tried to book a flight using only a mobile browser but it is possible on many airline and online travel booking sites. However, the latest version of Online travel giant Travelocity’s mobile site is probably not your best bet for any travel task. Travelocity’s mobile homepage is a bit sparse but looks usable in Opera Mini and the Android and Symbian browsers. Once you get off that homepage things begin to fall apart. To start with, clicking any of the booking options (air, hotel, car, etc) leads to Travelocity’s desktop site – which really doesn’t work very well with mobile browsers. If you still want to book with Travelocity your best bet is probably calling them using the provided click to call number. There are a couple of other potentially useful features on the site, a flight status checker and another for checking airport security wait times. Too bad they don’t work. 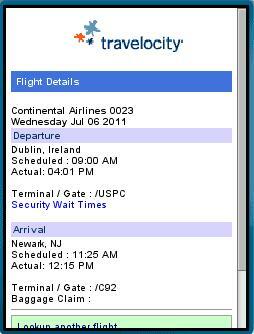 I certainly wouldn’t trust Travelocity’s flight status checker after it showed a flight leaving Dublin 7 hours late and arriving in Newark only 50 minutes late. Pretty sure that’s impossible. Then there’s the security wait time checker. Sounds handy except that it returned “There is no security wait time data available for your query” for every airport I checked including JFK, SFO and LAX! While I like Travelocity’s service and desktop site, it will be a long time before try using the mobile one again. This entry was posted in Travel and tagged mobile site review by Dennis Bournique. Bookmark the permalink.